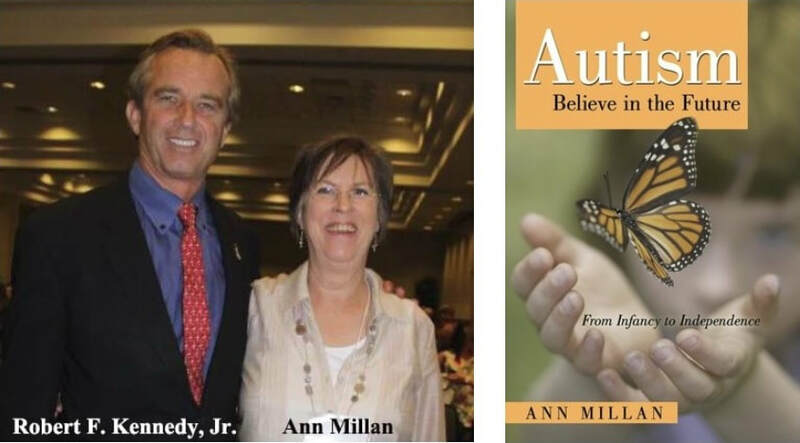 Ann Millan is the author of Autism: Believe in the Future, from Infancy to Independence (www.autism-believe-future.com) . She has been a disability advocate for over forty-five years, working with parents and professionals on the federal, state, and local level. Ann knows firsthand the importance of self-confidence and determination to make the right decisions for your child—and then to find quality professionals and funding to help reach your goals. Because of Robin's severe behavior issues in infancy, Ann quickly joined a local support group trying to learn more about disabilities. When Robin was a baby, autism was considered a developmental disability. Robin did not fit into any school programs and was transferred annually from school-to-school. Succeeding in advocating for everyone's child but her own, she withdrew Robin from the public school system at ten years old and homeschooled, supplementing with private therapies and regular community programs. After five years of homeschooling, Robin returned to public school, and she graduated with a Certificate of Attendance. Through the years, Ann has been a supportive card-carrying member and local president or board member of most organizations surrounding the disability world, including autism. As president of the local Association for Retarded Children (ARC) in 1975, she was their spokesperson at weekly school board and supervisor meetings, expecting implementation of Public Law 94-142; Education of All Handicapped Children Act. Ann helped develop and train families through the Parent Educational Advocacy Training Center (PEATC) on special education, supported by the Department of Education in Virginia. Along with other parents, Ann helped revive her local Association for Children with Learning Disabilities (ACLD), and she received a National award for developing classes through her county’s recreation department, Mastering Adaptive Gymnastics in Children (MAGIC). She was a Feingold diet counselor (no preservatives or food colorings) in her community for twelve years. Ann was an active member of her local Special Education Advisory Council and the Mental Health and Mental Retardation Services Board. After homeschooling, and Robin’s return to the school system, Ann became the Executive Director of the National Vaccine Information Center (NVIC). She advocated for families and helped represent the Center at Government meetings—Institute of Medicine (IOM), Department of Health and Human Services (DHHS), Center for Disease Control and Prevention (CDC), etc. She researched, developed and co-authored a report submitted to the DHHS, of vaccine reactions and deaths—comparing vaccine manufactures and lot numbers through the Vaccine Adverse Event Reporting System (VAERS). This report led to an NBC television broadcast, hosted by Tom Brokaw and Katie Couric in 1994. Moving to Florida, Ann continued her commitment to individuals with disabilities. Ann, and another mother, started a social group for adults wanting to be a part of their community, Mainstreamed Adults Singles at Home (MASH). Ann and Robin became members of their local Family Care Council (FCC)—a governor appointment. Ann was chairperson of her local council, and later statewide chairperson. She helped develop and publish brochures, newsletters, and a website for families (www.fccflorida.org). The booklet, Celebrate Employment, shared employment success of individuals with developmental disabilities, including autism, in Florida. Employer awards were presented by the Governor. Currently, Ann is Executive Director, Florida Institute on Community and Disability (www.myficd.org) and a board member of Gulf Coast Autism Association, advocating and helping parents maneuver the disability world. Ann and her husband Bob have three girls. They live in Clearwater. Contact Ann Millan on Facebook at ​facebook.com/ann.millan.7, by e-mail at autismfuture@gmail.com, and by phone at 727-480-9103. ◄ On the show this video was played from time index 19:29 to 24:00, showing the panelists' pep rally for vaccine danger deception. True vaccine safety testing is needed. Singer, Toni Braxton, announced in 2016 her son, Diezel Braxton, is no longer on the autism spectrum. As Ebony reports, July 3, 2018, he is now a model for Wilhelmina Models. Excerpt: "Editorial Note: This outbreak demonstrates that transmission of measles can occur within a school population with a documented immunization level of 100%. This level was validated during the outbreak investigation." Lasers can be used to speed the decay of radioactive waste like from Fukushima, "depleted" uranium, nuclear disasters, phosphate mining, etc. When a web search is performed of, "laser radioactive waste decay," you can find material like U.S. Patent 6331774 and from Helsinki University of Technology (http://www.academia.edu/20425892/Laser-enhanced_radioactive_decay_and_selective_transmutation_of_nuclei_revisited). Perform a web search also for, "laser radioactive waste decay water," and you'll find that it's effective for use on radioactive water, too. Radioactive isotopes with half lives of millions of years can be neutralized in less than an hour with lasers.